Strike Force or "The Librarians" is a stupid, fun action movie that doesn't take itself too seriously. 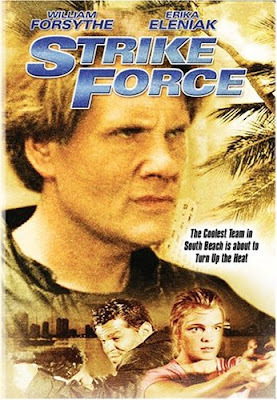 William Forsythe stars as Simon, who is looking for a missing daughter of a wealthy client. He meets up with Sandi (Eleniak) who is also looking for someone-her sister. But there are evil bad guys afoot. The most evil of them all is Marcos Canarious (Divoff). Marcos likes to kill people. So now, Simon and Sandi have to team up to bring down the villains. The whole cast is great, with Divoff stealing the movie. There are also cameos by Ed Lauter, Burt Reynolds, and esteemed star of stage and screen, Mark Foley (actually disgraced politician Mark Foley in the greatest cameo since Gloria Allred lit up the screen in On The Edge). If you are looking for a silly action film, watch this and have a good time.